Later this summer, the two University of Washington College of Education alumni will visit the White House and be honored for their outstanding teaching as recipients of the Presidential Award for Excellence in Mathematics and Science Teaching. Awarded annually to a handful of the nation's most outstanding K-12 science and math teachers, the prestigious award honors educators who are empowering children to think critically and creatively about science, technology, engineering and math. 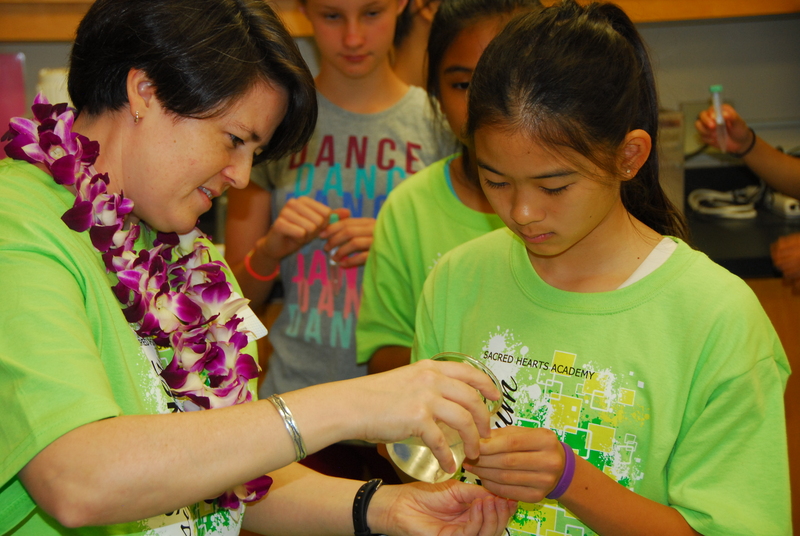 Flynn (MIT '05) began teaching biology at Sacred Hearts Academy in Honolulu in 2008 and has served as chair of its science department for the past three years. In her first year at the school, she helped prepare and implement a successful grant to transform teaching and learning to bring its students into the 21st century. "The education of our girls is now much more student-driven, through project-based learning and inquiry," Flynn said. "There is a deliberate focus on our students learning the skills that will allow them to be successful for careers, and life, in this ever-changing world." The opportunity to continually grow and improve her craft as a teacher inspires Flynn as she works with students. "It can be a little messy sometimes in biology, but the learning experiences are so rich," she said. "The other aspect I enjoy is that teaching science allows for me to be a perpetual student, because our knowledge base is always changing." For 13 years, von Bargen (MIT '02) has motivated students with engaging lessons and an infectious curiosity for biology. She teaches 11th and 12th grade International Baccalaureate biology at Skyline High School in Sammamish and infuses classes with multiple interactive methods to support science learning, including music, dance, games and modeling. Her students regularly perform and analyze their own science experiments in the classroom and the field. In addition to her teaching, von Bargen facilitates the New Teacher Academy, a districtwide mentoring program for new secondary teachers in the Issaquah School District and serves as coach in two Skyline professional learning communities. She also serves on the Professional Educators Advisory Board for the UW College of Education. "Mentoring and leading other teachers provides me the opportunity to help others while continuing my own professional growth," von Bargen said. "I believe strongly in the power of collegiality and constantly work with teachers in my school, my district, at a state level, nationally and globally to learn new techniques and to share knowledge of successful techniques with others, all with the hope of improving students' education." Flynn pointed to her "Science Teaching and Learning" course in the UW's teacher education program as the foundation of her teaching philosophy today. Taught by professors Mark Windschitl and Jessica Thompson, Flynn said the course turned her understanding of how students best learn completely inside out. "I remember a particular instance when Jessica pointed out to me that our role as teachers is not to disseminate information, rather, we are to build a safe learning environment where we allow students to ask their own questions, to explore, to explain their thinking and to build meaning from what they observe," Flynn said. "This was a major turning point that inspired me to change my approach entirely and, I believe, sent me on the path to where I am today with my teaching career."